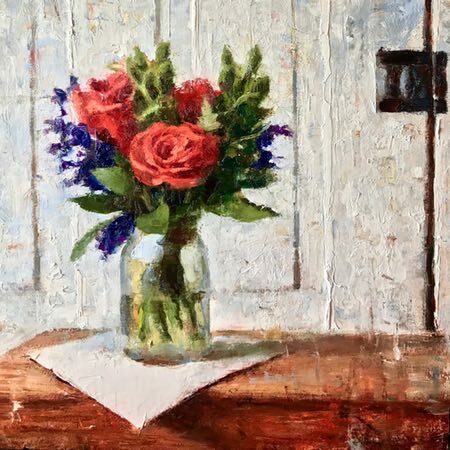 Michael Doyle is a painter based in the Delaware Valley area who paints figures, still life, landscapes and interiors. 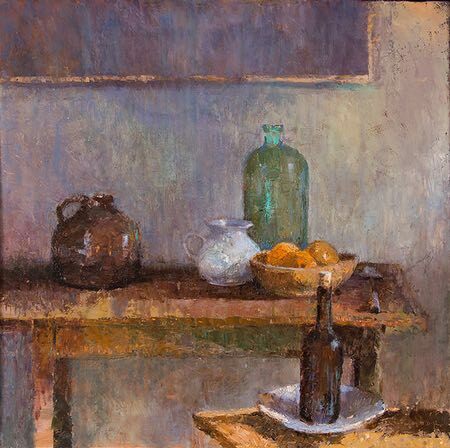 His landscapes and interiors often incorporate still life elements, handled with a rough edged, painterly style suited to their often rustic feel. Doyle frequently employs backgrounds that are textural combinations of multiple muted colors, giving them energy and a feeling of changing light. Michael Doyle’s work will be on display in a show at the Somerville Manning Gallery in Wilmington Delaware, beginning tonight, October 19 and running to November 10, 2018. 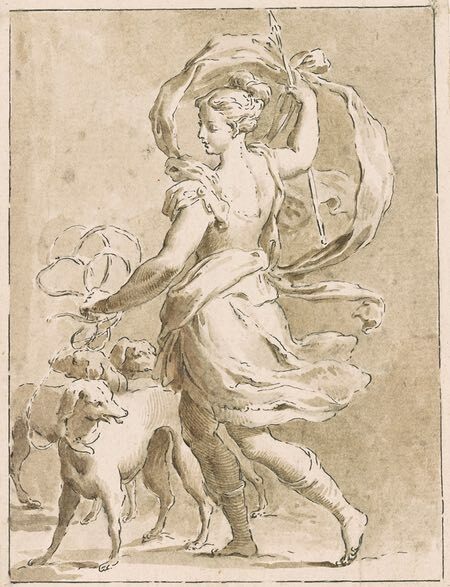 Link is to zoomable version on Google Art Project; downloadable file on Wikimedia Commons, original is in the Museu Nacional D-Art de Catalunya. 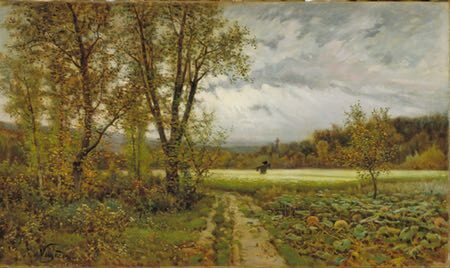 19th century Spanish painter Joaquim Vayreda gives us a nicely evocative scene of farm fields in early Autumn. Edward Julius Detmold and his twin brother Charles Maurice Detmold were book illustrators active in the “Golden Age” of illustration in the late 19th and early 20th centuries. 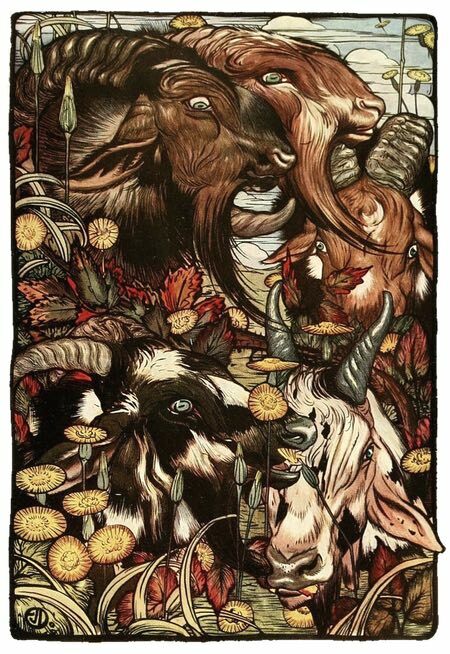 Both were interested in natural history and animals, and even in their illustrations for books like Kipling’s The Jungle Book and The Fables of Aesop, their images were more likely to feature animals than people. Both worked in watercolor and ink and were influenced by Japanese Prints, Art Nouveau and the Pre-Raphaelite painters as well as their contemporary illustrators. I can’t find as much information about Charles, so I’ve focused here on Edward Detmold, and the images shown are (as far as I can determine) by Edward. Link is to page with access to high-resolution image file on Wikimedia Commons. Original is in the Tretyakov Gallery, Moscow. I’ve never had the pleasure of seeing the original, but the Tretyakov image seems a little over exposed to me, so I’m going with the Wikimedia version. 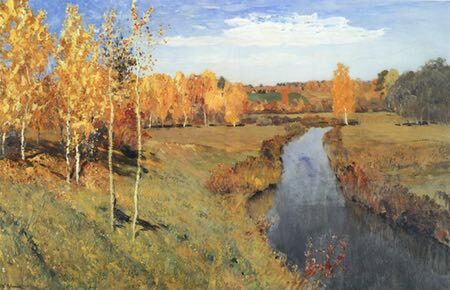 A justifiably famous painting by the 19th century Russian landscape master. Brilliant use of complementary blues and oranges. The greens are more subdued than they may appear at first glance — even when set against strategically placed spots of complementary red — allowing the yellow-oranges to dominate. I love the variety of color and texture in the grasses.